Hey Chomps! (That's one of Alexander's favorite videos). Good to see that you are continuing to expand those communication skills! There does seem to be an overwhelming number in the medical profession that tend to ignore us mere mortals. There's been a time or two in my experience when I wish I'd been able to employ the method you used to get the Doc's attention. My wife Shirley has actually stood in a doorway and blocked a doctor's retreat and told him that he wasn't leaving until he answered her questions. When you're old enough and tall enough to fill the doorway, that method works too! 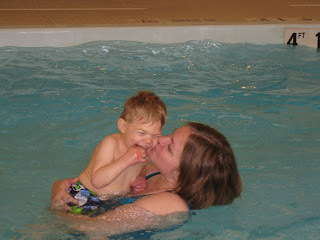 I loved the photos of you in the water with mom and dad. The water is a lot of fun and I used to spend a lot of time swimming at the local beaches. 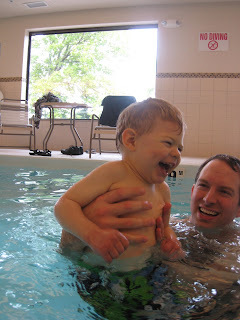 Great exercise and learning to swim and get comfortable in and around the water is a life-long skill that you will always find ways to utilize. I've worn glasses since about the 5th grade and they have benefits and drawbacks. One of the benefits was that I thought I would no longer have to sit in the front row in school because I could now read the board from the back of the room. It wasn't long though before I found myself sitting in the front row anyway. Apparently my teachers really liked me and wanted me close to them most of the time! Who knew?! Don't you worry about getting a little behind either. We all learn and grow at our own pace. Why, when I wuz yer age, I remember the adults talking about the local butcher who had backed into his meat grinder. He even got a little behind in his work. God's word tells us to be of good cheer. This is because in the end all of the things that we deal with in this life just don't matter much. It's our attitude that really matters so I've spent most of my years developing an attitude! According to some sources close to me, I really doing well at that too! You just hang onto that determination and keep on truckin'. Hope to see you soon. Your 'ol buddy, Jim Buckmaster. I LOVE those pictures in the pool!!! Elijah is so so so adorable!